Russian artist Sergei Tutunov wrote a lot of paintings. Lush spring bouquets in elegant vases, portraits of relatives, landscapes – he glorified nature and beauty, love and sincerity in his works. “Winter has come. Childhood “: looking at this work, close to many emotions are recognized. 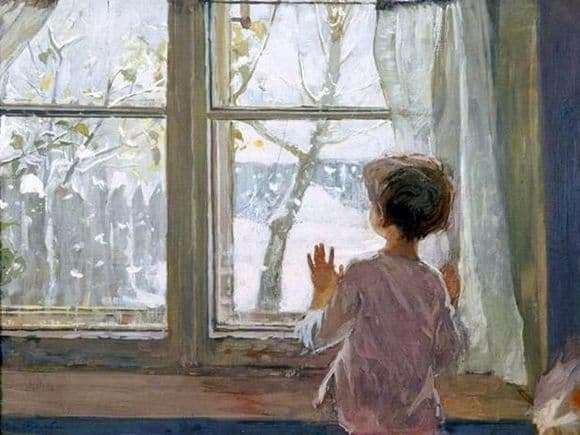 A window, a modest curtain, a little boy froze, clinging his palms to the window glass – snow fell on the street. How often with the onset of winter months, tired of dark frosty days, I want to plunge into a cozy fairy tale. And the long-awaited snowball happily gives us this opportunity. He always appears unexpectedly, but is loved by all children and adults who have kept the memory of their happy, full of carefree fun, childhood. It seems the boy just woke up. Forgetting about sweet dreams, about breakfast and favorite toys, he rushed to the window and fascinated looking at the flying fluff of snow, on a smooth velvet carpet in the courtyard. A white magic winter covered the houses and trees. So, there will be a New Year – a holiday of the best gifts and good mood. So, you can go with the guys from the yard to ride on a sled, laughing happily and smiling, catching beautiful snowflakes. Now you can play snowballs. And having played enough, run to a warm house, where a caring grandmother has already brewed tea and baked delicious homemade cookies. Painting Tutunova causes a whirlwind of memories of childhood. She returns to another, better time, when snowfalls were the most expected in winter. Seeing a white blanket on the street, we could consider ourselves the most successful and happy in the world. Soviet painter proved himself to be a master of landscape. Oil paint rests on the canvas in smooth, careful strokes, as if afraid to break the fragile harmony of the winter miracle. The picture is light and in the palette of colors, and in the emotional experiences born of its contemplation.